The Pour le Mérite ([puʁ lə me.ʁit], French, literally "For Merit") is an order of merit (German: Verdienstorden) established in 1740 by King Frederick II of Prussia. The Pour le Mérite was awarded as both a military and civil honour and ranked, along with the Order of the Black Eagle, the Order of the Red Eagle and the House Order of Hohenzollern, among the highest orders of merit in the Kingdom of Prussia. After 1871, when the various German kingdoms, grand duchies, duchies, principalities and Hanseatic city states had come together under Prussian leadership to form the federally structured German Empire, the Prussian honours gradually assumed, at least in public perception, the status of honours of Imperial Germany, even though many honours of the various German states continued to be awarded. New awards of the military class (known in First World War informally as the Blue Max, German: Blauer Max) ceased with the end of the Prussian monarchy in November 1918. The civil class was revived as an independent organization in 1923 (Pour le Mérite für Wissenschaften und Künste). Instead of the King of Prussia, the President of Germany acted as head of the order. After the Second World War, the civil class was re-established in 1952. This version of the Pour le Mérite is still active today. The Pour le Mérite is still an order into which a person is admitted into membership, like the United Kingdom's Order of the British Empire, and is not simply a medal or state decoration. German author Ernst Jünger, who died in 1998, was the last living recipient of the military class award. The Pour le Mérite was founded in 1740 by King Frederick II of Prussia. It was named in French, which was the leading international language and the favoured language at Frederick's court. The French name was retained, despite the rising tide of nationalism and increasing hostility between French and Germans during the 19th century, and ironically many of its recipients were honoured for acts performed in wars against France. 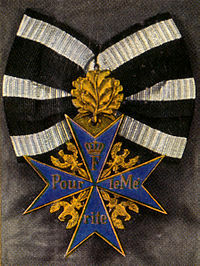 The insignia of the military award was a blue-enameled Maltese Cross with golden eagles between the arms (which is based on the symbol of the Johanniter Order) and the Prussian royal cypher and the words Pour le Mérite ("For Merit" in French) written in gold letters on the body of the cross. The ribbon was black with edge stripes of silver-white. The order consisted of only one class, both civil and military, until 1810. Only a few civilians were honored: Pierre Louis Maupertuis (1747), Francesco Algarotti (1747) and Voltaire (1750). In January 1810, during the Napoleonic wars, King Frederick William III decreed that the award could be presented only to serving military officers. In March 1813, the king added an additional distinction, a spray of gilt oak leaves attached above the cross. Award of the oak leaves originally indicated extraordinary achievement in battle, and was usually reserved for high-ranking officers. The original regulations called for the capture or successful defense of a fortification, or victory in a battle. By World War I, the oak leaves often indicated a second or higher award of the Pour le Mérite, though in most cases the recipients were still high-ranking officers (usually distinguished field commanders fitting the criteria above; the few lower ranking recipients of the oak leaves were mainly general staff officers responsible for planning a victorious battle or campaign). In early 1918, it was proposed to award the oak leaves to Germany's top flying ace, Manfred von Richthofen, but he was deemed ineligible under a strict reading of the regulations. Instead, Prussia awarded von Richthofen a slightly less prestigious honor, the Order of the Red Eagle, 3rd Class with Crown and Swords. This was still a high honor, as the 3rd Class was normally awarded to colonels and lieutenant colonels, and von Richthofen's award was one of only two of the 3rd Class with Crown and Swords during World War I. In 1866, a special military Grand Cross class of the award was established. This grade of the award was given to those who, through their actions, caused the retreat or destruction of an army. 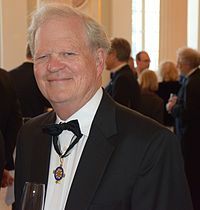 There were only five awards of the Grand Cross: to King Wilhelm I in 1866, to Crown Prince Frederick William of Prussia (later Emperor Frederick III) and Prince Frederick Charles of Prussia in 1873, to Tsar Alexander II of Russia in 1878, and to Helmuth Graf von Moltke in 1879. The Pour le Mérite gained international fame during World War I. Although it could be awarded to any military officer, its most famous recipients were the pilots of the German Army Air Service (Luftstreitkräfte), whose exploits were celebrated in wartime propaganda. In aerial warfare, a fighter pilot was initially entitled to the award upon downing eight enemy aircraft. Aces Max Immelmann and Oswald Boelcke were the first airmen to receive the award, on January 12, 1916. It was awarded to Germany's highest-scoring ace, Manfred von Richthofen, in January 1917. Although it has been reported that because of Immelmann's renown among his fellow pilots and the nation at large, the Pour le Mérite became known, due to its color and Immelmann's first name, as the "Blue Max," that has not been confirmed. The number of aerial victories necessary to receive the award continued to increase during the war; by early 1917, it generally required destroying 16 enemy airplanes, and by war's end the approximate figure was 30. However, other aviation recipients included zeppelin commanders, bomber and observation aircrews, and at least one balloon observer. Recipients of the "Blue Max" were required to wear the award whenever in uniform. Although many of its famous recipients were junior officers, especially pilots, more than a third of all awards in World War I went to generals and admirals. Senior officer awards tended to be more for outstanding leadership in combat than for individual acts of bravery. Junior officers (army captains and lieutenants and their navy equivalents) accounted for only about a fourth of all awards. Several famous lieutenant-ranked (Kapitänleutnant) U-boat commanders, including Lothar von Arnauld de la Perière (U-35), Walther Schwieger (U-20) Otto Hersing (U-21) and Otto Weddigen, received the Pour le Mérite. The last new member admitted to the military class of the order was flying ace Theo Osterkamp, on 2 September 1918. The military class of the Pour le Mérite became extinct as a result of Kaiser William II's abdication as king of Prussia and German Emperor on 9 November 1918. This marked the end of the Prussian monarchy and it was never awarded thereafter; however the honour continued to be recognized for, and worn by, previous recipients. In 1842, King Frederick William IV of Prussia, acting on the advice of Alexander von Humboldt, founded a separate civil class of the order, the Order Pour le Mérite for Sciences and Arts (Orden Pour le Mérite für Wissenschaften und Künste), with the three sections: humanities, natural science and fine arts. When a vacancy occurred the Academy of Arts and Sciences nominated three candidates, one of whom the king appointed. In November 1918 the Kingdom of Prussia came to an end, and with it that state's sponsorship of the Pour le Mérite. However, unlike the military class of the order, the class of the order for achievements in the arts and sciences did not come to an end. The members re-established their order as an autonomous organization, with revised rules and processes for nomination. The awarding of new memberships resumed in 1923. Recipients included Albert Einstein (1923), Käthe Kollwitz (1929) and Ernst Barlach (1933). During the era of National Socialism in Germany (1933–45), the order was re-absorbed into the state honors system, and the list of its members was reviewed and revised according to the policies of the new government. A number of Jews and other perceived dissidents or "enemies" of the state were deprived of their awards by the Nazi regime. They included Einstein (who resigned his membership in the order in 1933, and refused invitations to renew it after the war), Kollwitz, and Barlach. Such actions were later repudiated by both the order, and the postwar German government. In 1952, with the assistance of President of West Germany Theodor Heuss, the order was again re-established – now as an independent organization with state recognition and the President of the German Federal Republic as Protector of the Order. However, unlike the somewhat similar Bundesverdienstkreuz (Federal Cross of Merit) also established by Heuss, it is not a state order. 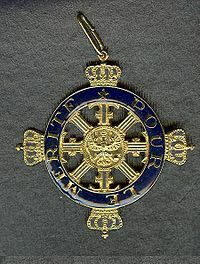 The revived civil order of the Pour le Mérite is awarded for achievements in the arts and sciences. Active membership is limited to 40 German citizens, ten each in the fields of humanities, natural science, and medicine and the arts. Honorary membership can be conferred on foreigners, again to the limit of 40. When a vacancy occurs, the remaining members select a new inductee. Henning Alexander von Kleist. Prussian general, awarded Pour le Mérite in 1741 by Frederick II for actions during Battle of Mollwitz during War of Austrian Succession. Isaac de Forcade de Biaix, Prussian colonel and later Hofmarschall to the Prince of Prussia Frederick William II, heir to the throne of Prussia, awarded on 11 June 1742, as a captain with the 18th Prussian Infantry Regiment (von Derschau) for his actions during the First Silesian War. Friedrich Wilhelm Quirin von Forcade de Biaix, Prussian lieutenant general, awarded on 6 January 1746 as a colonel for his actions in the Second Silesian War on the battlefield during the Battle of Soor, the victory of which Frederick the Great attributed to him. Friedrich Wilhelm von Seydlitz, awarded 1757, during the Seven Years' War. Charles-Emmanuel de Warnery. Major General. Cavalry. In October 1756 for actions at the Battle of Lobositz. Peter III of Russia, who received the Pour le Mérite in 1762 when he withdrew Russia from the Seven Years' War and made peace with Prussia. Gerhard von Scharnhorst, Napoleonic-era Prussian general. Friedrich Wilhelm Freiherr von Bülow, Napoleonic-era Prussian general; also received the oak leaves. Karl Friedrich von dem Knesebeck, Napoleonic-era Prussian general (later field marshal); first decorated in 1807, received the oak leaves in 1814. Karl Wilhelm Georg von Grolman, Napoleonic-era Prussian general; also received the oak leaves. Ludwig Graf Yorck von Wartenburg, Napoleonic-era Prussian general (later field marshal); also received the oak leaves. August von Gneisenau, Napoleonic-era Prussian general (later field marshal); first decorated in 1807, received the oak leaves in 1814. Hermann von Boyen, Napoleonic-era Prussian general and Minister of War; simultaneously received the Pour le Mérite and the oak leaves. Ernst von Pfuel, Prussian general and Prime Minister of Prussia; decorated in 1814 during the Napoleonic Wars. Helmuth Graf von Moltke, known as "Moltke the Elder"; first decorated in 1839 as a junior officer; he received the oak leaves in 1871 and the Grand Cross in March 1879. Also inducted into the civil class of the order in 1874. Leonhard Graf von Blumenthal, Prussian general (later field marshal) decorated with the Pour le Mérite in the 1864 German-Danish War and the oak leaves in the 1866 Austro-Prussian War. Otto von Bismarck, Prussian minister president and German chancellor during the unification period; decorated in 1884 with the Pour le Mérite with oak leaves. Also inducted into the civil class of the order in 1896. Leo von Caprivi, Prussian general, decorated in 1871 for merit in the Franco-Prussian War. Kurt Wintgens, the first military aviator ever to down an enemy aircraft with a synchronized machine gun (July 1915), earned his medal in July 1916 with as many as 22 total victories. Hermann Göring, decorated as an ace pilot in June 1918, later Reichsmarschall, head of the Luftwaffe, and Third Reich second in command. Manfred von Richthofen, better known as the "Red Baron", the top-scoring ace of World War I.
Lothar von Richthofen, German flying ace with 40 victories. Younger brother of Manfred Von Richthofen. Ernst Udet, second-highest-scoring German ace of World War I.
Werner Voss, fourth-highest-scoring German ace of World War I.
Josef Jacobs, German flying ace with 48 victories. His total tied him with Werner Voss, ace of World War I.
Bruno Loerzer, German flying ace with 44 victories. Julius Buckler, German flying ace with 36 victories. Gotthard Sachsenberg, German flying ace with 31 victories. Kurt Wolff, German flying ace with 33 victories. Heinrich Kroll, German flying ace with 33 victories. Max Immelmann, with Oswald Boelcke, one of the first aviator recipients. Oswald Boelcke, with Max Immelmann, among the first aviator recipients. Rudolf Berthold, high-ranking German ace shot to death by German communists in 1920. Robert Ritter von Greim, World War I ace and World War II field marshal. Eduard Ritter von Schleich, better known as the "Black Knight", destroyed 35 enemy aircraft. Carl Menckhoff, fighter ace, with 39 confirmed victories. Ernst von Hoeppner, Commanding General of the Air Service. Theo Osterkamp, naval aviator and World War I ace; also scored six victories in World War II and became a Luftwaffe general. Josef Veltjens, German fighter ace, with 35 confirmed victories as lieutenant (reserve). Hans Joachim Buddecke, German fighter ace in World War I, credited with thirteen victories. He was the third ace, after Max Immelmann and Oswald Boelcke, to earn the Blue Max (Pour le Mérite). He fought in Gallipoli to fly the Halberstadt D.II and Fokker E.III with Ottoman FA 6 against the Royal Naval Air Service. The Turkish campaign was successful, with four confirmed victories and seven unconfirmed, and Buddecke was personally awarded the Gold Liakat Medal by Enver Pasha. Fritz Pütter, German flying ace with 25 victories. Erwin Rommel, decorated as an Oberleutnant in December 1917, later a Field Marshal and commander of the German Afrika Korps in World War II. Paul von Hindenburg, German field marshal and later President of Germany; awarded the Pour le Mérite in September 1914 and the oak leaves in February 1915. Erich Ludendorff, German general of World War I; awarded the Pour le Mérite in August 1914, one of the earliest World War I awards, for the siege of Liege, Belgium; received the oak leaves in February 1915. Rupprecht, Crown Prince of Bavaria, German field marshal; awarded the Pour le Mérite in August 1915 and the oak leaves in December 1916. Albrecht, Duke of Württemberg, German field marshal; awarded the Pour le Mérite in August 1915 and the oak leaves in February 1918. Werner von Blomberg, decorated as a major in June 1918. Fedor von Bock, Awarded Pour le Mérite in 1917 for efforts of leading his battalion at the Somme and Cambrai. Later Field Marshal and commander of Army Group North, Polish campaign, 1939. Commander Army Group B in conquest of Western Europe 1940. Commander Army Group Centre in Russia 1941. Commander Army Group South in Russian Ukraine and Caucasus 1942. Erich von Falkenhayn, Chief of the German General Staff from 1914 to 1916; awarded the Pour le Mérite in February 1915 and the oak leaves in June 1915. Oskar von Hutier, German general awarded the Pour le Mérite in September 1917 and the oak leaves in March 1918. Georg Bruchmüller, German colonel and artillery officer in von Hutier's 8th Army. Paul von Lettow-Vorbeck, German general who led the German Schutztruppe in the guerrilla campaign in German East Africa; awarded the Pour le Mérite in November 1916 and the oak leaves in October 1917. Otto Liman von Sanders, German general who served as adviser and commander of Ottoman forces in World War I; awarded the Pour le Mérite and the oak leaves simultaneously in January 1916 for his role in the Battle of Gallipoli. Friedrich "Fritz" Karl von Lossberg, World War I master-strategist; expert in the Defence in depth. Awarded 21 September 1916 (Somme); oak leaves on 24 April 1917 (Arras). August von Mackensen, German general (later field marshal) of World War I; awarded the Pour le Mérite in November 1914 and the oak leaves in June 1915. Helmuth Johann Ludwig von Moltke, Chief of the German General Staff at the outbreak of World War I. Nephew of Moltke the Elder. Friedrich Freiherr Kress von Kressenstein, German officer in the Near East campaigns of World War I.
Otto von Garnier, German General of the Cavalry awarded the Pour le Mérite in October 1916. Max Hoffmann, German staff officer; awarded the Pour le Mérite in October 1916 and the oak leaves in July 1917. Hans von Seeckt, German staff officer in World War I; awarded the Pour le Mérite in May 1915 and the oak leaves in November 1915. Ernst Jünger, Army Lieutenant and later novelist, the last living holder of the Pour le Mérite at the time of his death in 1998. Ferdinand Schörner, decorated as a Leutnant in December 1917, later a field marshal in World War II. Johann von Ravenstein, German officer, In May 1918 his battalion broke through the opposing line at Soissons. After capturing the notorious Chemin des Dames, he succeeded, with 10 soldiers, in capturing the bridge over the Aisne at Bourg intact. His troops took 1500 prisoners and captured 32 cannons. Later served in the Afrika Korps. Alexander von Falkenhausen, German colonel, for victories in two Jordan battles in March and May 1918 against British troops. Alfred von Tirpitz, German Grand Admiral, decorated in August 1915. Reinhard Scheer, German admiral and commander of German naval forces in the Battle of Jutland. Nikolaus Burggraf und Graf zu Dohna-Schlodien, German auxiliary cruiser commander; one of only two junior officers to receive the highest military honors of the five main German states. Karl August Nerger, German auxiliary cruiser commander; one of only two junior officers to receive the highest military honors of the five main German states. Karl Friedrich Max von Müller, captain of the famous German commerce raider, the light cruiser Emden during the first few months of World War I.
Felix von Luckner, captain of the Seeadler, a sailing ship used as a commerce raider. Lothar von Arnauld de la Perière, German U-boat commander during the First World War, awarded the Pour le Mérite in the autumn of 1916 for sinking 200,000 tonnes of Allied shipping. Walther Schwieger, German U-boat commander who sank the British liner RMS Lusitania. Otto Weddigen, German U-boat commander of World War I.
Friedrich Christiansen, decorated as Naval Pilot Oberleutnant on 11 December 1917. Among famous recipients of the civil class of the Pour le Mérite in the first group of awards in 1842 were Alexander von Humboldt, Carl Friedrich Gauss, Jakob Grimm, Felix Mendelssohn, Friedrich Wilhelm Joseph Schelling and August Wilhelm Schlegel. Foreign recipients in the "class of 1842" included François-René de Chateaubriand, Louis Daguerre, Michael Faraday, Jean Auguste Dominique Ingres and Franz Liszt. Later recipients included Thomas Babington Macaulay (1853), John C. Frémont (1860), Theodor Mommsen (1868), Charles Darwin (1868), Friedrich Wilhelm August Argelander (1874), Thomas Carlyle (1874) (who never accepted any other honor), Max Müller (1874), Henry Wadsworth Longfellow (1875), William Thomson, Lord Kelvin (1884), Heinrich von Treitschke (1887), Johannes Brahms (1887), Giuseppe Verdi (1887), William Henry Flower and Hubert von Herkomer (1899), Camille Saint-Saëns (1901), Luigi Cremona (1903), John Singer Sargent (1908), Ferdinand von Zeppelin (1910), Otto Lessing (sculptor) (1911), Wilhelm Conrad Röntgen (1911), Sir William Ramsay (1911), Max Planck (1915), and Rudolph Sohm (1916). New members of the revised order in 1923 included Albert Einstein (1923), Gerhart Hauptmann (1923), Richard Strauss (1924), Wilhelm Furtwängler (1929), antiwar sculptor Käthe Kollwitz (1929) – the first female recipient of the honor – and Ernst Barlach (1933). Among those inducted in 1952 were Otto Heinrich Warburg, Otto Hahn, Paul Hindemith, Reinhold Schneider and Emil Nolde. Later recipients include Arthur Compton (1954), Hermann Hesse (1954), Albert Schweitzer (1954), Thomas Mann (1955), Oskar Kokoschka (1955), Carl Orff (1956), Erwin Schrödinger (1956), Thornton Wilder (1956), Karl Schmidt-Rottluff (1956), Werner Heisenberg (1957), Gerhard Ritter (1957), Lise Meitner (1957), Ludwig Mies van der Rohe (1957), Percy Ernst Schramm (1958), Carl Friedrich von Weizsäcker (1961), Karl Jaspers (1964), Otto Klemperer (1967), Carl Zuckmayer (1967), Henry Moore (1972), Raymond Aron (1973), George F. Kennan (1976), Friedrich Hayek (1977), Karl Popper (1980), Emil Schumacher (1982), Eugène Ionesco (1983), Hans Bethe (1984), Gordon A. Craig (1990), Carlos Kleiber (1990), Witold Lutosławski (1993), Fritz Stern (1994), Rudolf Mößbauer (1996), Umberto Eco (1998), Hans Magnus Enzensberger (1999), Bronisław Geremek (2002), Wim Wenders (2005), James J. Sheehan (2006) and Svante Pääbo (2008). More recent recipients were Gidon Kremer (2016), Emmanuelle Charpentier (2017) and Heinz Holliger (2018). Besides Prussia, several other states of the former German Empire also conferred similar awards for the arts and sciences. These included the Kingdom of Bavaria's Maximilian Order for Art and Science (Maximiliansorden für Kunst und Wissenschaft), the Duchy of Anhalt's Order of Merit for Science and Art (Verdienstorden für Wissenschaft und Kunst), and the Principality of Lippe's Lippe Rose Order for Art and Science (Lippische Rose, Orden für Kunst und Wissenschaft). A number of other countries have founded similar high civic honors for accomplishments in the arts and sciences. The sovereign of the Commonwealth realms confers the Order of Merit and Order of the Companions of Honour. The Republic of Austria confers the Austrian Decoration of Honor for Science and the Arts, founded in 1955. Like the Order Pour le Mérite for Sciences and Arts, this was in a sense a revival of an earlier imperial award, in this case the Austro-Hungarian Decoration of Honor for Art and Science (Österreichisch-Ungarisches Ehrenzeichen für Kunst und Wissenschaft), which existed from 1887 to 1918. Unlike the German award, however, the design of the modern Austrian award is unlike that of its imperial predecessor. France has the Ordre des Arts et des Lettres for significant contributions to the arts and literature. In Poland the Gloria Artis Medal has been established for the same purpose. Other countries also may recognize accomplishments in the arts and sciences, but with more general orders also awarded for accomplishments in other fields. France's Légion d'honneur is an example of a decoration often conferred for accomplishment in many fields, including the arts and sciences. Belgium awards either its Order of Leopold or Order of the Crown for outstanding accomplishments in the arts and sciences, and may award its Civil Decoration for lesser accomplishments in these fields. ^ a b c Lehmann 1913, p. VIII. ^ Hildebrand, Karl-Friedrich; Zweng, Christian (1998). Die Ritter des Ordens Pour Le Mérite. Osnabrück: Biblio-Verlag. ISBN 978-3-7648-2473-0. ^ a b c van Wyngarden, Greg (2006). Early German Aces of World War I. Osprey Publishing Ltd. ISBN 978-1-84176-997-4. ^ Gaudi, Robert (2017). African Kaiser: General Paul Von Lettow-Vorbeck and the Great War in Africa, 1914-1918. Penguin. ISBN 9780425283714. 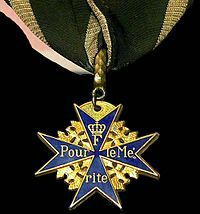 ^ "Pour le Merite | Prussian honor". Encyclopedia Britannica. Retrieved 2017-08-14. ^ Gilbert, Martin (1983). La grande storia della prima guerra mondiale [First world war] (in Italian). Milan: Oscar Mondadori. p. 69. ISBN 978-88-04-48470-7. ^ Burke, Bernard, ed. (1858). The Book of Orders of Knighthood and Decorations of Honor. London: Hurst and Blackett. p. 202. ^ Lehmann 1913, p. 35, I No. 249. ^ Lehmann 1913, p. 36, I No. 251. ^ Lehmann 1913, p. 43, I No. 310. ^ Fuhrmann 1992, p. 47. ^ Gelbke, Carl H. von (1834). Ritterorden und Ehrenzeichen, erläutert durch die vorhandenen Urkunden. Berlin. p. 34. ^ "Der Orden "Pour le Mérite"". Lebendiges Museum Online. 8 September 2016. Retrieved 2017-06-30. ^ Biermann, Kai; Cielewicz, Erhard (2005). Flugplatz Döberitz: Geburtsort der militärischen Luftfahrt in Deutschland (in German). Ch. Links Verlag. p. 62. ISBN 978-3861533719. ^ "Stiftungsurkunde vom 31. Mai 1842 (Amtsdruck)" (in German). Orden Pour le Mérite für Wissenschaften und Künste. 31 May 1842. Retrieved 14 September 2018. ^ Hieronymussen, Paul (1967). Orders and Decorations of Europe in Color. New York: The Macmillan Company. p. 171. ISBN��978-0025514003. ^ Lehmann 1913, p. 17, I No. 98. ^ Lehmann 1913, p. 18, I Nr. 113. ^ Lehmann 1913, p. 34, I Nr. 245. ^ Lehmann 1913, p. 45, I No. 317. ^ Lehmann 1913, p. 49, I No. 356. ^ Lehmann 1913, p. 102, I No. 591. ^ Lehmann 1913, p. 200, II No. 82. ^ Anthing, Johann Friedrich von (1799). Versuch einer KriegsGeschichte des Grafen Alexander Suworow Rymnikski Russl: Kayserl: General FeldMarschal. 3. Gotha. p. 171. ^ Lehmann 1913, p. 441, III No. 108. ^ Lehmann 1913, p. 261, II No. 387. ^ Lehmann 1913a, p. 105, III No. 851. ^ Lehmann 1913, p. 462, III No. 143. ^ Lehmann 1913a, p. 137, III No. 988. ^ Lehmann 1913, p. 447, III No. 117. ^ Lehmann 1913a, p. 166, III No. 1226. ^ Lehmann 1913, p. 492, III No. 217. ^ Lehmann 1913a, p. 90, III No. 790. ^ Lehmann 1913a, p. 211, III No. 1372. ^ Lehmann 1913a, p. 260, III No. 1654. ^ Lehmann 1913a, p. 342, III No. 2292. ^ Lehmann 1913a, p. 517, V No. 214. ^ Lehmann 1913a, p. 557, V No. 302. ^ Lehmann 1913a, p. 586, VII No. 162. ^ Lehmann 1913a, p. 442, V No. 9. ^ Lehmann 1913a, p. 467, V No. 71. ^ Lehmann 1913a, p. 559, V No. 305. ^ Lehmann 1913a, p. 592, VII No. 248. ^ Lehmann 1913a, p. 511, V No. 201. ^ "Count von Waldersee". The Times (36529). London. 9 August 1901. p. 3. ^ Lehmann 1913a, p. 569, VI No. 10. ^ "Rommel: Ende einer Legende". Der Spiegel (in German). Hamburg. 21 August 1978. Retrieved 13 September 2018. ^ Müller, Wilhelm (2013). Politische Geschichte der Gegenwart: 18. Das Jahr 1884 (in German). Heidelberg: Springer Verlag. p. 93. ISBN 9783642991806. ^ Orden Pour le Mérite für Wissenschaften und Künste (1978). Die Mitglieder des Ordens 1882–1952 (PDF) (in German). 2. Berlin: Gebr. Mann Verlag. p. 116. ISBN 978-3-7861-1125-2. Lehmann, Gustaf (1913). Die Ritter des Ordens pour le mérite 1740–1811 (in German). 1. Berlin: Ernst Siegfried Mittler & Sohn. Lehmann, Gustaf (1913a). Die Ritter des Ordens pour le mérite 1812–1913 (in German). 2. Berlin: Ernst Siegfried Mittler & Sohn. Fuhrmann, Horst (1992). Pour le Mérite, Über die Sichtbarmachung von Verdiensten (PDF) (in German). Sigmaringen: Thorbecke. ISBN 978-3-7995-4159-6. Wikimedia Commons has media related to Pour le Mérite.